I want to share with you a tool that has deeply affected me and has deeply touched and transformed my clients as well. In fact, after I taught a training on this tool to some of my programs a few weeks ago, the results were dramatic: one of my clients signed 4 mastermind participants within 2 days, another signed 2 new clients within 24 hours, another started writing on her true message instead of just circling around what pays the bills, and yet another gave the best presentation of her career to date. I have learned that the antidote to nearly any business problem — not enough clients or income, problems with team members, clients not getting the results they want, not enough visibility, exhaustion, frustration — is to speak your truth, the hard truth that you know in your heart, no matter what. 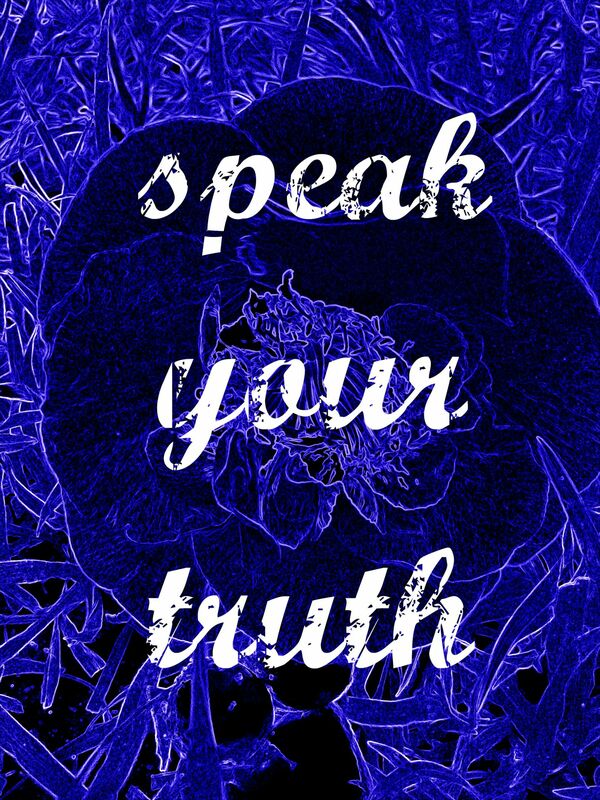 Speaking Your Truth means just that, not telling any lies, not hiding, and tapping straight into your heart about what you know to be true, and being willing to share it with others. While this sounds simple, Speaking Your Truth can feel very challenging, because most of us, from a young age, were taught to squash our truth, to sweep it under the rug, to choose pleasing others instead of being true to ourselves. Having the courage and conviction to speak your truth means un-learning what you were taught and learning to trust yourself and your inner wisdom implicitly. (Not work for the faint-hearted). This is such a deep, wide and vast topic (I could teach for hours on it), but I want to give you some specific tips and pointers to bring your Truth into all areas of your business. 1) when it comes to sharing the value of your work and how it can help your prospect. 2) when it comes to sharing the possibilities you see for your prospect. 3) or when it comes to being really honest with your prospect about where you see she is faltering, where she really needs help, and what her patterns are. It’s essential in enrollment conversations to be brave and honest and call things out exactly as you see them for your prospect, as well as stand in your value. I know this feels scary, because you don’t want to offend your prospect, but the Truth will actually magnetize aligned folks to you, because you will have touched them deeply with your ability to really see them and stand up for them. More clients will come through the door and be very excited about working with you. (If you want a loving dose of Truth about how we see your patterning, your obstacles, and what’s possible for you and your business, apply for a Find Clients For Your Sacred Work call today). One big obstacle I see for many entrepreneurs is that you aren’t totally honest in your marketing copy or when you give presentations. It’s not that you’re “lying” per se, but you’re not giving the full Truth. Perhaps you’re not fully, fully explaining how important your product or service is and what a difference it can really make, or perhaps you know that the trends in your industry or society are not working but you’re not speaking out about it, or perhaps about what you’re really good at, and what you’re not so good at. I shifted into Speaking my Truth big time over the last year when it has come to the coaching industry. I couldn’t take another moment of “guru” coaches promising 6-figures overnight or highly inflated prices without results, and so I started writing about it — in my newsletters, on Facebook, and speaking about it at my events. The results? Most importantly, a feeling of liberation and alignment. And from there — an influx of new and very aligned folks who really resonated with my Truth into my community and programs. This one can be super tricky for a lot of folks. I know that if you’re reading this article, you are good at what you do. But do you know what will make you absolutely stellar at what you do? Being totally, completely 100% honest with your clients about where you see they are sabotaging themselves and holding themselves back. Being 100% honest with your clients about what you see as their full potential and their gifts. Being 100% completely honest with your clients when you see they are being taken advantage of, not upholding their boundaries, or taking action that is misaligned. Of course, you need to be skilled at sharing this information with your clients. You also want to be certain that they are in a place to really receive it, but when you can do this, WOWza, it’s magic. My clients are consistently transformed and brought closer to their goals through my commitment to sharing with them the truth as I see it. And yours can be too…if you Speak Your Truth! This is another huge topic, with lots to say, but I’ll get to the core of it. Always, always, always Speak Your Truth when it comes to others you’re relating to. If a team member is not performing the way he should — speak it and share the effect that his less-than-good work is having on you and your business. If a joint venture partner isn’t doing what she said she would — speak up and let her know what the agreement was and why you need her to uphold it. If a partner isn’t supporting you in the ways you need, talk about it, and ask for your needs to be met. The more and more you Speak Your Truth in all areas of your business, the more spaciousness, freedom, and alignment you’ll feel…and the more positive results in sales and income you’ll see. Where are the places you could be speaking more of your truth? What effect will that have on your business and happiness level? If you are ready to build the courage and conviction to Speak Your Truth in your marketing and in all areas of your business, get in touch with us for a complimentary call to do a 360-degree assessment of your business — on this call, we’ll look together at the areas that will help you level up immediately, and give you a blueprint for starting to make that happen. We will only speak with women who we sense we can really help, so fill out an application, and we’ll get back to you right away!